Registrations WILL be accepted after the deadline, October 14. PLEASE REGISTER as soon as possible so we may make adequate preparations. PLEASE NOTE: We have just been notified of some changes in regard to transportation to and from Pittsburgh International Airport. If you need to revise the form you sent in, please contact Amy Stiffler, at events@antiochianvillage.org, or by phone at (724) 238-3677. 2) Super Shuttle. Limousine service is the only option with this company. You can have up to 3 people for a charge of $234 each way. Their website is www.supershuttle.com/en/PITAirportShuttlePittsburgh.html; or phone: 1-800-258-3826. Pittsburgh’s airport code is PIT. The shuttle has scheduled the following times at this point: Thursday, November 3rd, 3:45 and 6:00 p.m.; Saturday November 5th, 3:00 p.m.; Sunday, November 6th, 12:00 noon. The Village has advised us to allow two hours travel time due to traffic. It is worth the trip! Read an interview with Fr. Thomas Hopko, and Maria Khoury's Letters From the Holy Land! Everyone I have spoken to about the 2011 Orthodox Institute at Antiochian Village is very excited about this “event like no other!” Mark your calendars now for November 3-6, 2011 at Antiochian Village, outside of Pittsburgh, Pennsylvania. We “took it up a notch,” last year primarily by offering presenters well-known in the field of iconography. This is now our model. In keeping with last year’s new and improved (and very successful) Institute, this year we will again offer the following: 1) presenters well known in the field of Scripture, 2) book signings, 3) a wine and cheese reception, 4) a review of new materials for Church Schools, and 5) gifts throughout the weekend.In addition, this year we will offer, ready to use for the benefit of your parish and church school: 6) a packaged Parish Bible Study program, and 7) packaged sample craft materials and instructions to take home. Finally, for all who attend, there will be a discount coupon towards 8) a new vacation church school program, based on the theme of this Institute. In addition to the benefit of gathering with others in the ministry, mention these reasons to your parish council when you ask for full or partial funding to attend! You can download the flyer by clicking here (PDF). The Holy Land is Coming to Antiochian Village! The idea of posters led to our plans for an exciting exhibit—a 1,000 square foot interactive tour of the Holy Land. 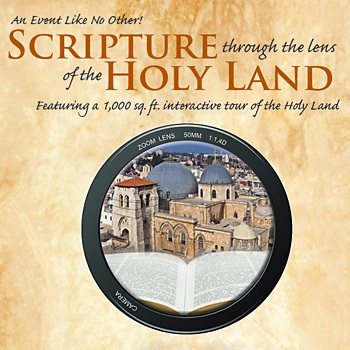 Using 6’ x 8’ office-space dividers, we will be displaying life-size photographs and maps, as well as artifacts, sights and sounds, costumes and plants so that you can wind your way through many of the sacred sites of the Holy Land. We couldn’t think of a better tour guide for this experience than Dr. Maria Khoury, author and speaker, from Taybeh, Palestine, and indeed, she will be with us once again. The vacation church school program will be devised by shrinking the 6’ photographs to child-size, and of course, by devising lessons and activities based on Scripture and the exhibit. As Antiochian Orthodox, the Holy Land is our particular inheritance, and I am so pleased that we will be developing this vacation church school program for all Orthodox. You can follow our plans and progress on Facebook at Orthodox Institute 2011: Scripture & the Holy Land. The Institute will begin with an inspirational keynote address by Fr. Thomas Hopko who will also teach two of the three “core courses:” “Overview of the Bible,” and “The New Testament,” with the latter focusing on the Gospels. Fr. Thomas requested that the two courses be considered as two parts of the same course so he could provide a more in-depth study. Imagine four hours to learn from and ask questions of Fr. Tom in a classroom setting! For the third core course, “Jesus in the Old Testament,” we are delighted to have Dr. Nicolae Roddy, Associate Professor of Hebrew Scriptures/Old(er) Testament at Creighton University. Dr. Roddy is perfect fit for our theme as he is also an archaeologist in the Holy Land. Our three core courses will be presented both Friday and Saturday. Click here to read an interview with Dr. Roddy. Also with ties to the Holy Land is our presenter Fr. Foaud Saba, from St. George parish in Cicero, Fr. Saba has established an academy for adults interested in studying the Bible. He is a first generation American whose family comes from the ancient city of Lydda. He will be presenting “A Parish Bible Study Model,” and those in attendance will receive a package of all materials so they can establish a parish bible study program. I interview both of the presenters below. Click here to read an interview with Fr. Fouad. The additional theme courses are: “Women in the Bible,” “The Bible and Children/Adolescents”, “Implementing the Vacation Church School Program ‘Scripture through the Holy Land,’ and “Tour of the Holy Land.” We will also offer Church School Director Training and Advanced Teacher Training. For the first time, the logos of the Greek Orthodox Archdiocese, the Orthodox Church in America Department of Christian Education, and the Orthodox Christian Education Commission appear on our publicity. Although we are still the host, we are pleased to be working with these jurisdictions to offer a phenomenal event. Along the lines of “hopping on board,” our collaboration is likely to increase our attendance. One way we can encourage people to come is to offer to coordinate van rental or even carpooling from the major cities of Cleveland, Chicago, Detroit, and Newark. If the cost, or the idea of traveling alone was an issue, consider this. Contact our office EARLY if you are interested. WATCH FOR NEW POSTINGS THE FIRST OF EACH MONTH! AND FOLLOW US ON FACEBOOK: Orthodox Institute 2011: Scripture & the Holy Land.